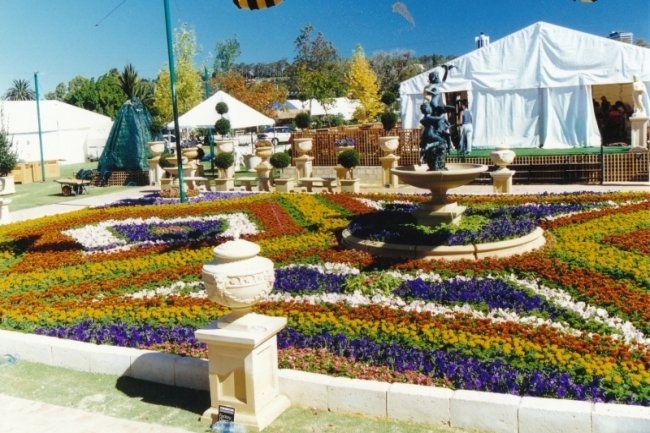 This displays ranks as the largest ever central gardening display Perth has ever seen. 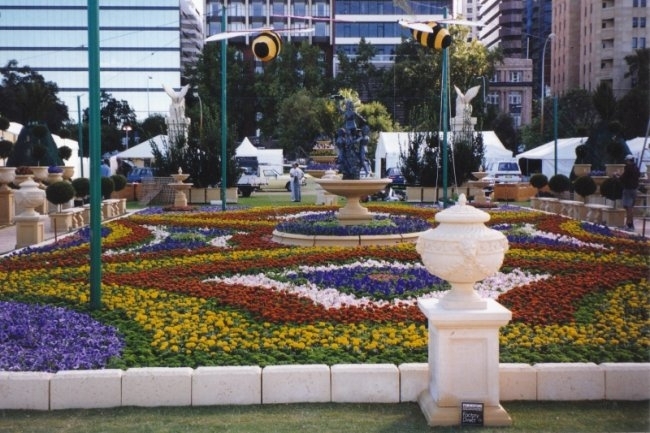 Colin Barlow of GFE was commissioned by the Nursery Industry Association of WA to design a 50 metre by 40 metre central display on the Perth Esplanade with over 20,000 potted annuals provided by Sunnyvale Plants. The design ‘Nature’s Tapestry’ encompassed a twenty by twelve metre intricate parterre with five Formstone fountains planted with colourful potted petunias, marigolds, vincas and bordered with hedges of parsley providing rich texture . The parterre was bordered by lawn and paving providing the public with access right around the parterre. Overhead butterflies and bees hovered in suspension. The pathway was bordered with large flower fountains, topiary, urns and pyramids of cabbages, while huge Formstone columns with sphinxes perched on top guided the public to the entry of the display. Advanced trees created an avenue to the elevated marquee and restaurant areas adjacent to the display. Colin Barlow of GFE project managed the construction of the display with students from Challenger Institute of Technology assisting in the placement of the pots.